I’ve been working on this frame for almost ten days now. The idea was to create an exterior scene with a modern looking house that had a little bit of a traditional Aegean touch. Finally, I came up with this scene where you can see the house covered with trees behind, as well as ponds and simple grass which I modeled and then scattered using ForestPack Lite. The tiles were, again, randomized using RailClone2 Lite and in the diffuse slot of their material I used one of my favorite scripts called MultiTexture which greatly reduces the risk of repetition in cases like these. The same goes for the turquoise ceramics covering the wall of the kitchen. RailClone and MultiTexture come in really handy in cases where you need to scatter objects but need to protect the uniqueness of each member of the objects you are tiling. The biggest challenge I faced during creating this scene was probably modeling the sofa. Although it is a simple modern sofa with only a little bit of complexity, it took me over 6 hours to model it and to do the upholstery on Marvelous Designer. Then of course, there was the process of unwrapping it for generating the UVW coordinates precisely which takes quite some time if you have a high-poly model. I placed two paintings by William Stoehr behind the sofa which were illuminated by a single source of light in between the two. For this scene, I decided to go for a reddish purple colored sky which you get during the sunset in order to punctuate the light coming from the house. I placed several diffuse lights coming from different rooms in the house and I believe it allowed for a nice ambient environment that enhances the feeling of the scene drastically. In order to increase the effect of these diffuse lights, I decided to create venetian plaster for the material of the walls. The ceiling is made up of concrete blocks in whose material’s diffuse slot I applied a VrayDirt map with a mask in order to get the white, washed away effect you can see at the outer faces of the concrete blocks. 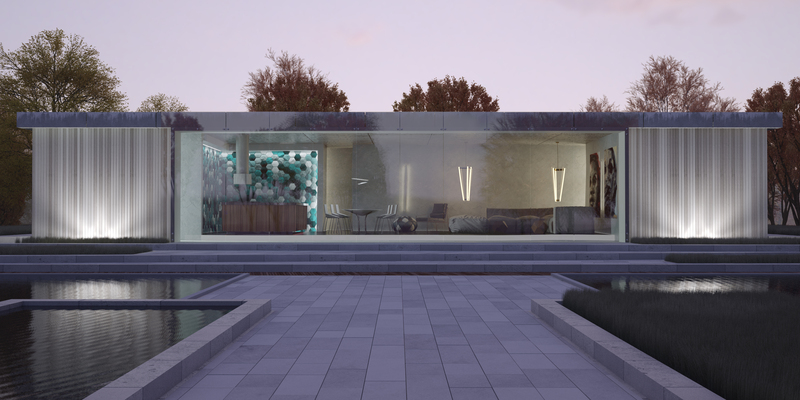 The façade was covered with large panels of two layered glass on top of each other with differing bump maps, therefore I was able to get the two layers of reflections resulting in a natural look. The water of the ponds was created using a pretty reflective black material with several layers of falloff maps in both the reflection and the refraction slots. For the bumps, again I used a two layered mix map in order to create the larger waves and the smaller waves. The foggy look behind the trees was procedurally created on Photoshop with the help of a VrayZDepth pass which I enabled in the render settings beforehand. Waiting for your comments and criticisms. Posted in Exteriors, InteriorsTagged 3D, 3dsmax, Aegean, architectural, architecture, armchair, bump, cheveron, chevron, concrete, exteriors, glass, herringbone, house, ies, interiors, leather, LED, lighting, marvelous designer, material, multiscatter, multitexture, pass, plaster, pond, procedural, railclone, reflection, scatter, sofa, stoehr, stool, tiles, unwrap, uwv, velvet, venetian, villa, vray, vraydirt, vrayzdepth, williamBookmark the permalink.